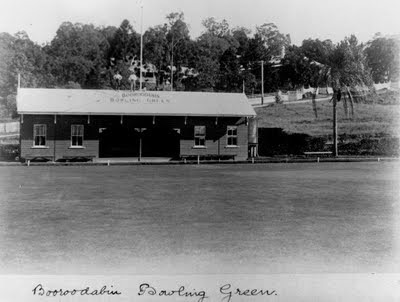 The oldest bowls club in Queensland is the Booroodabin Bowls Club at Newstead, established in 1888. The sport of lawn bowls itself can be traced right back to the time of the Pharaohs - over 9000 years ago - and its variants, such as bocce, boule and petanque are played in many parts of the world. Australia's earliest recorded game of bowls took place in Tasmania in 1845, and since then bowls has been extremely popular in Australia. There are currently around 250,000 bowls clubs members in Australia today. Never having played bowls myself I am hardly an expert, but I seem to recall that, at one time, bowls was the most popular sport in the country based on the number of active participants. This photo of the Booroodabin green and clubhouse (below) was taken in 1908. A further picture, below, shows how bowls was played around the turn of the twentieth century. Gentlemen are wearing coats and ties, and the few ladies present are spectators only. My own recollection of bowls is that the uniform requirements were quite strict, and there was frequent discussion about coloured clothing and the lengths of the skirts to be worn by the female players. It sits like an oasis on Breakfast Creek Rd at Newstead - right opposite the Eagers car yards - one of the busiest thoroughfares in the city. I think that it has done rather well to avoid having been swallowed up by progress.